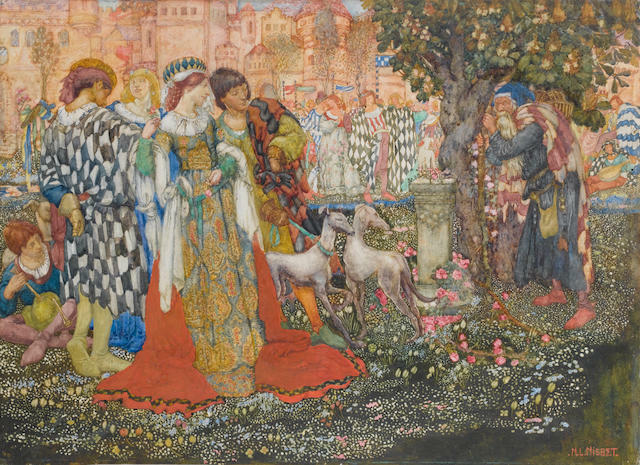 Noel Laura Nisbet (1887-1956) was part of an artistic family, enabled to follow her dreams by her father's generosity, and the creator of some unforgettable and original Pre-Raphaelite-influenced works. Her father was a bit of a character, on the whole. 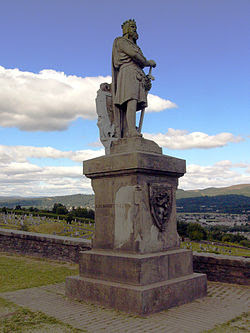 Born in 1849, Hume Nisbet was the son of a painter and decorator, James Herkis Nisbet. In 1866, the family sailed for a new life to Australia, settling in Melbourne. Hume Nisbet spent his time travelling around and trying various careers including a spot of theatre work and writing, not to mention a bit of painting too. Harry was famous for his paintings of suburban London and his pictures are very restful and beautiful, even when they show bombed-out houses. Anyway, in the 1911 census, just after the couple had married, Noel and Harry lived in Clapham with Noel's brother, Andrew, who is described as an 'author'. Harry is an 'Advertisement Designer' and Noel is a 'Painter (Artist)' (I suppose as opposed to 'Painter (houses)'). Noel and baby daughter Hazel spent the First World War in Bath Cottage in Speen while Harry was away. Hume bought his artist daughters two matching houses in Merton Park, now Old Merton Park, near Wimbledon. Have a look at 19 Queensland Avenue on Google Streetmaps and you'll see why the houses were so special - both Noel and Margaret's houses had artist's studios in the attic space. Noel, Harry and the kids spent the rest of their lives there. 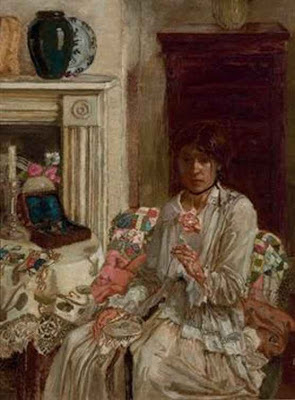 Noel exhibited in the 1914 Royal Academy, then another 23 times between 1914 and 1938. 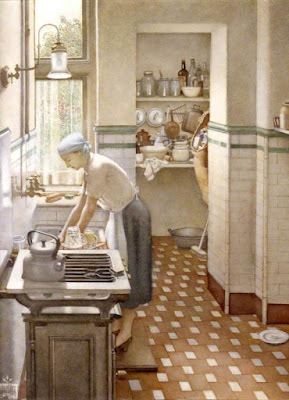 She was elected to the Royal Institute of Watercolour Painters in 1926 and the British Watercolour Society in 1945. 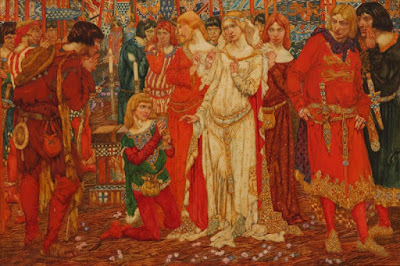 She also provided beautiful fairy tale illustrations for books and her work can be seen as an extension of what Elenor Fortescue Brickdale had been doing earlier in the century. Her illustrations for Cossack Fairy Tales and Folk Tales (1916) can be downloaded here. Noel Laura Nisbet's work is busy and florrid, filled with detail and colour. Her work is fascinating in subject. 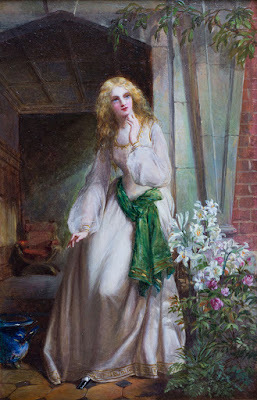 Often referred to as 'the last Pre-Raphaelite' (although there must be as many 'last Pre-Raphaelites' as pieces of the true cross), it is possible to see aspects of Burne-Jones physicality in her figures, and the wonderful medieval clothes are reminiscent of some of the earliest watercolours by Rossetti. The colours are quite astonishing. Noel and Harry lived out their days in the comfortable house in Merton Park with their daughters Hazel and Janet. Margaret, her sister, remained at the other end of the road, never married, and died only six years before her sister, in 1950. Harry died a year after Noel, and their work was the subject of a major sale at Christies (possibly just after Janet died) in 1984. 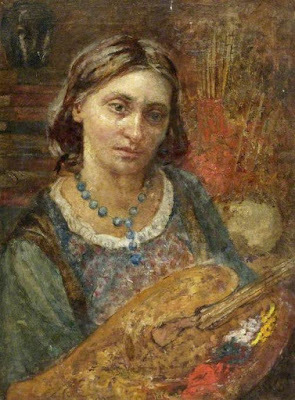 Today, Noel's work can be seen in a few public collections, for example the Russell-Cotes in Bournemouth, which is where I first encountered her. 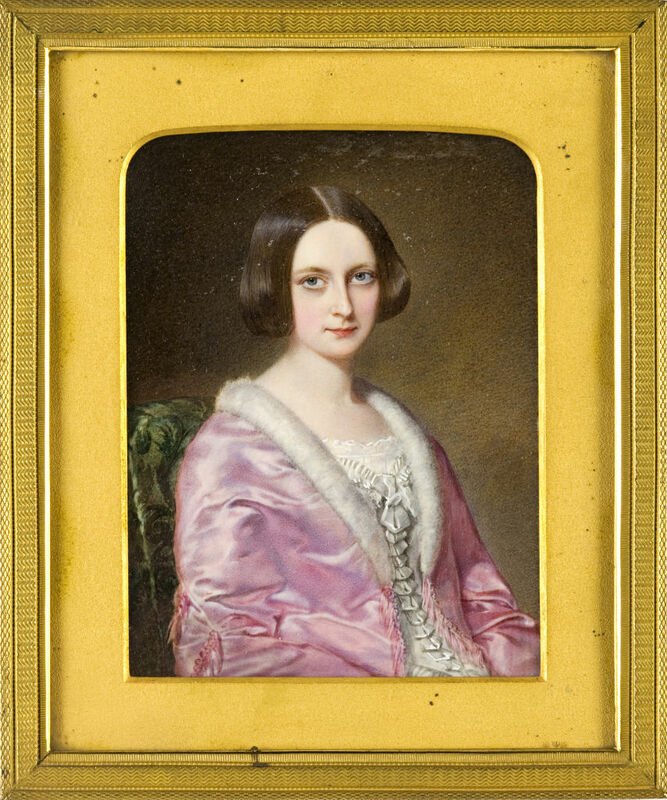 Before William Maw Egley, there was William Egley Snr, a successful miniaturist painter from Doncaster. 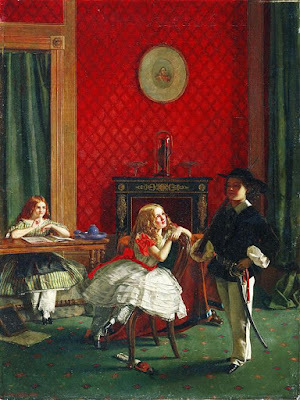 He had rebelled against his father's wishes and not become a bookseller, rather taking up his passion for painting and making a career for himself. He was a jovial chap, good with children which made him much in demand for child portraits. He seems to have become a Quaker when he married his first wife, Sarah, in Norfolk in 1825. Their only son, William Maw Egley was born and christened a Quaker in 1826, recorded by the Society of Friends in Paddington where the Egley family lived. William Maw Egley started painting at the age of 14 under his father's tutelage. 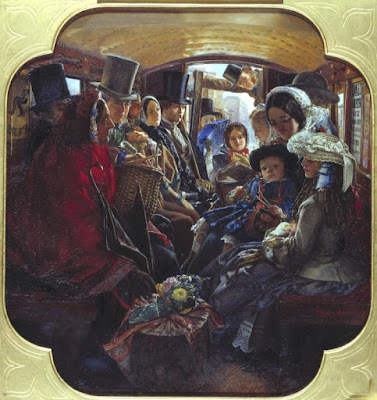 He moved on to work for William Powell Frith, a member of a group of painters called 'The Clique'. 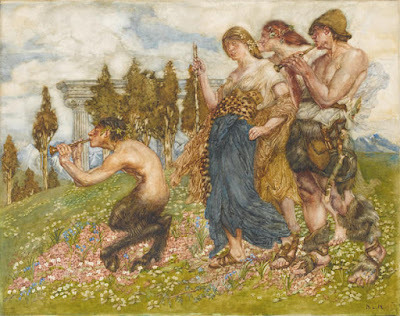 The Clique were a band of young artists (sound familiar) who rejected the old ways of the Academy and made new, contemporary art. 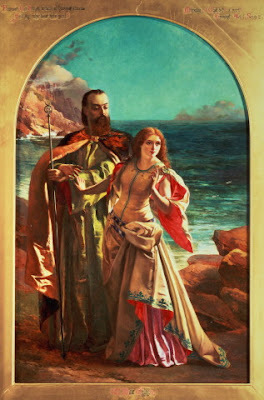 The group consisted of Richard Dadd, Augustus Egg, Alfred Elmore and other artists you probably have heard of but are just before the Pre-Raphaelites. 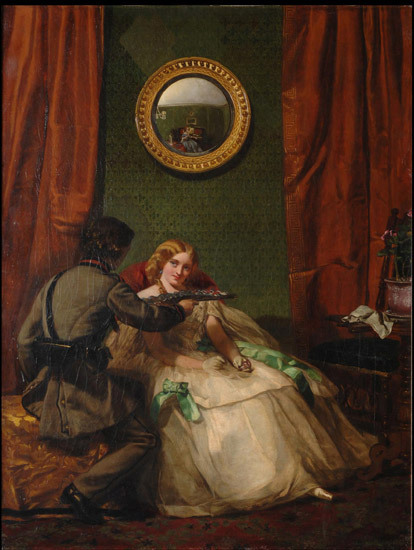 They loathed the Pre-Raphaelites, incidentally, in the marvellously predictable way that rebels always loath younger rebels. 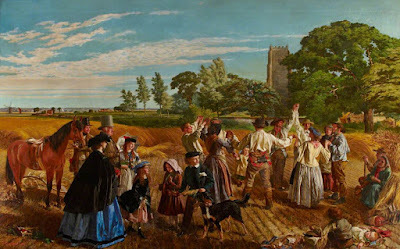 Anyway, Frith, despite running two households and two families (naughty boy), employed William Maw Egley to paint his backgrounds. 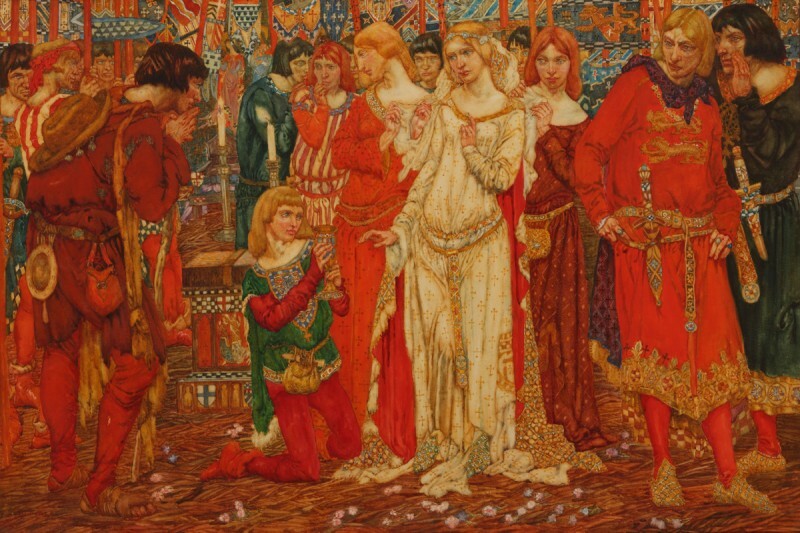 Maw Egley's early work is on literary subjects and he had an obsession with costume, which is always exquisite in his paintings. He made a special study of children's clothing which seemed a bit odd until I read how popular his father was as a children's portraitist so possibly he was encouraged by his father. A very odd story I read about William Maw Egley was that he was the creator of the very first Christmas card. Now, this is obviously not true, but for decades this story seemed to reoccur in the newspapers, almost every Christmas, until the 1970s. 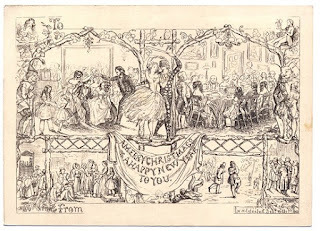 It was thought that teenage Egley designed a card for his family in 1842 (as the young tend to do in their spare time) and shows various Christmas-y activities with Columbine and Harlequin in the centre. In the right-hand corner is Egley's signature and a rather ambiguous date which was assumed to be 1842 (a year before Sir Henry Cole's Christmas card). However, one learned art historian managed to uncover the truth by rigorous research (by which I mean they took it out of the frame and turned it over) and it was actually dated 1848. Anyway, Maw Egley holds the slightly less exciting accomplishment of second Christmas card ever. Those of you who have watched the film Akenfield will no doubt be shouting 'Largesse!' at this point as these charming villagers are calling in the harvest. As his mother came from Norfolk, it is possible that Egley was familiar with this sort of celebration and this is possibly a recognisable place. In the 1860s, Egley adopted an easier, romantic, more commercial subject, often touching on the eighteenth century. Whilst he didn't become a massive success, he started to do moderately well. However, it's in his awkward, intense earlier work that I find the most enjoyment. This is a particularly apt picture to show as it is an example of how Egley is familiar but just not the person you think of first. 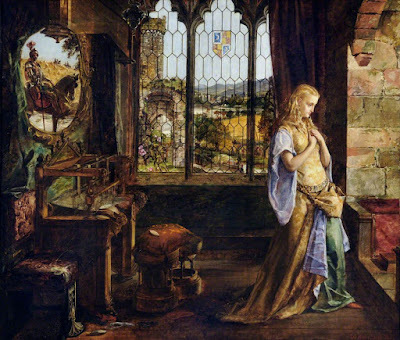 His 'Lady of Shalott' crops up when you start talking about Pre-Raphaelite-esque depictions of Tennyson's poem but he gets lost in the Waterhouse deluge. It has much to recommend it - look at the window in the back of the image, with those tiny lead cells, and that mirror above the frame where she was working. Our little blonde lady is clutching her heart as she stares at her fatal attraction both as a symbol of love and also her now progressing death. The stonework is gorgeous. 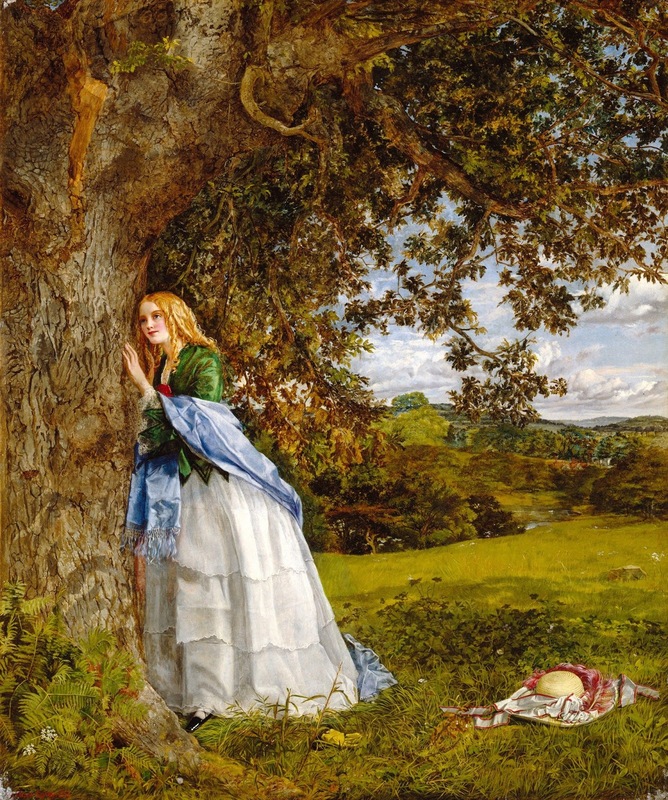 Another Tennyson subject is The Talking Oak, with the lovely Olivia hugging the tree (who wishes he was a younger, smaller tree so she could get her arms around him). I am oddly reminded of Mr and Mrs Andrews by Gainsborough because of the way the figure and the tree are shoved over to the left and the beautiful swell of countryside dominates our view. These two are my favourite of Maw Egley's works as they are marvellously gossipy and show how Blondie becomes a prize flirt at the expense of her brunette sibling. It's all very ambiguous in whether it's a good thing that Blondie neglected her studies, but we all know that girls who read don't get the boys and will remain reflected in their miserable corner. Well, we've all learned something today. Marvellous. I saw this one with alternative titles which mean something no doubt. Do we assume that the girl at the front is unaware of how much the little boy wants her attention? She is sort of the opposite of Blondie who could not be doing more to get her chap's attention. Do we also assume that our little boy is going to grow up to be a soldier? Please can someone tell me who the handsome chap on the wall is, but I'm guessing he is a war hero - is it Nelson or Wellington or someone? This is what I have Mr Walker for, he knows that sort of thing. 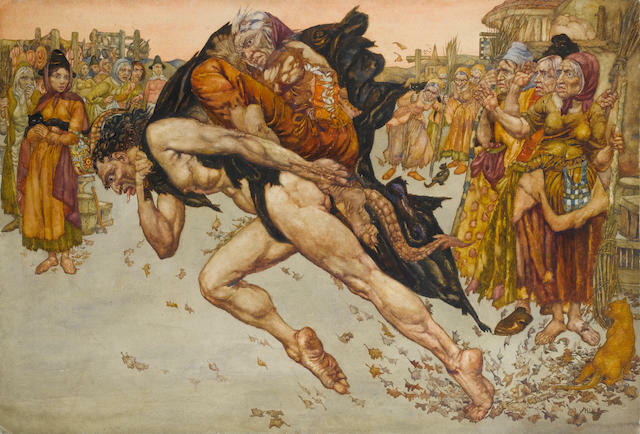 Anyway, Egley's oddness did not endear him to the painting-buying market and he never made it as a massively successful artist. When he died, he left only £125 and no longer lived in his own home, staying with relatives. 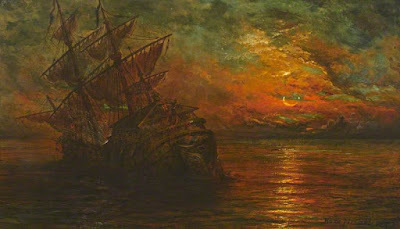 It would be nice to know a little more about him and to see him paintings together again in a retrospective.